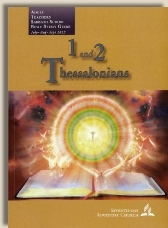 Commentary on "1 and 2 Thessalonians"
Commentary on "Friends Forever (1 Thess. 2:13-3:13)"
Copyright 2012 BibleStudiesForAdventists.com. All rights reserved. Revised August 4, 2012. This website is published by Life Assurance Ministries, Camp Verde, Arizona, USA, the publisher of Proclamation! Magazine. Contact email: BibleStudiesForAdventists@gmail.com.